Royal River Grill House in Yarmouth sounded like a place I would enjoy. With lots of seafood, in addition to steaks, pork, chicken, vegetarian options, interesting apps, salads, and the like, there were more than enough choices to make picking the perfect meal a challenging but enjoyable task. In addition, I was excited about the water views I was told we would have during our time there. We made reservations and then headed over that night in fog so thick it was difficult to see 20 feet in front of us. So much for those water views. Entering the restaurant, I was quite taken by the look of the place. Apparently, it was renovated recently and it showed. The interior was stunning. The beautiful bar backdrop, cozy lounge area, and exquisite lighting gave way to an open upper level. The place was hopping and lively and it was clear why. The look alone made it a bit of an attraction even without the ability to see its outdoor surroundings. We were seated very quickly next to the lounge area. We had to move the table to get into our seats due to space constraints. There was no moving the chairs. They were insanely heavy. Made of lead or gold, it didn’t matter. No one could steal them without a crane to load them into a trailer. They were nice and comfortable though, so it seemed fine that they were mostly stationary. The menu looked promising with many of the items we had seen online available that evening. We passed on drinks except for a seltzer and lime for my wife. For food, I had a hankering for fish or chicken and Mrs. Portlandeater seemed excited about ordering a sea dweller of some type. We agreed that an appetizer would be good to share. 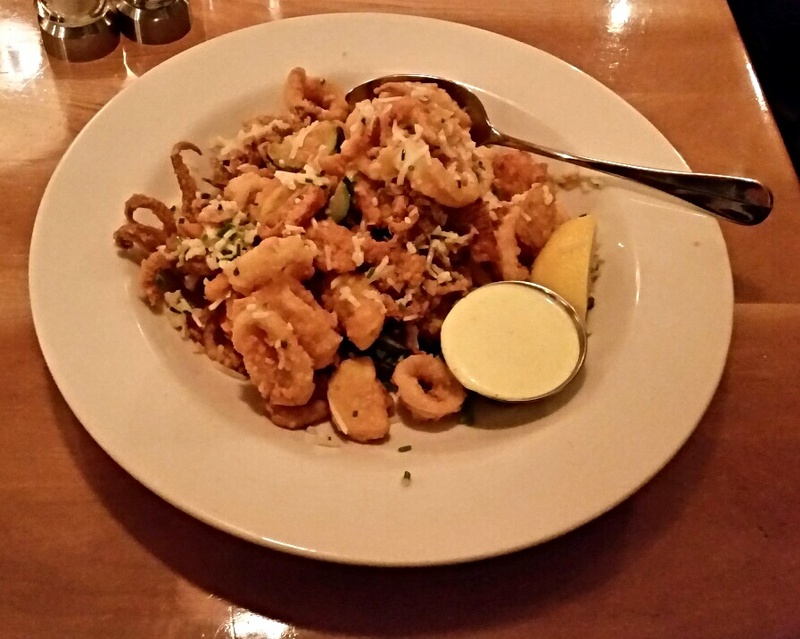 Two appetizers seemed more appealing to us than the others – Crab Cakes and Sea Salt and Vinegar Calamari. We eventually decided on the latter with fried vegetables, sea salt, rice vinegar, parmesan & pepperoncini aioli. We put in that order and worked on making our entree choices. It didn’t take very long for us to decide. I wanted the Diver Scallop Carbonara – pan seared diver scallops, house smoked pork belly, peas, fresh fettuccini pasta, local egg & parmesan cheese sauce. 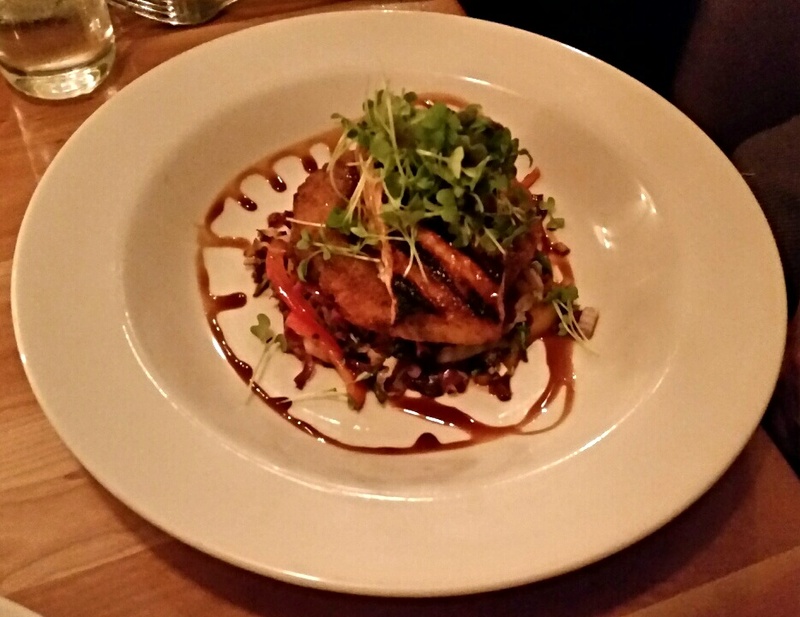 My wife fancied the Grilled Salmon – crispy rice cake, julienned vegetables & wasabi-soy glaze. Our Calimari came out extraordinarily quickly and we put in the rest of our orders. For the most part the plate looked like the usual squid app sitting on a bed of lettuce and included some zucchinI, squash, peppers, and possibly other fried veggies. The portion was relatively large, so I was mildly concerned that the aioli it came with wouldn’t be enough. I squeezed some lemon over the dish and was ready to go. I took in a couple pieces of the fried buggers with and without the aioli. I found the flavor to be fairly light with both the calamari and dipping sauce. The vinegar was subtle, but what transformed the dish a few bites in was the parm. The combination of cheese, salt, and vinegar enveloped the squid in a swath of flavor. It was really good. I found the aioli to be sufficiently apportioned as I didn’t eat all the calamari with it since the flavor was so good without. As though there was some sort of magic going on in the kitchen, our other food came out very quickly again – pretty much as soon as we were done the app. My four scallops looked perfectly seared and the three-ish pork pieces sat in the center of the meal lightly covered in garnish. My wife’s plate was layered with veggies on the bottom, the large rice cake over those, and the salmon on top. Based on the speed of the meal’s arrival, I was a little concerned that the plates were sitting in the kitchen already put together and then zapped in the microwave when the order came in. Fortunately, they didn’t taste that way at all. 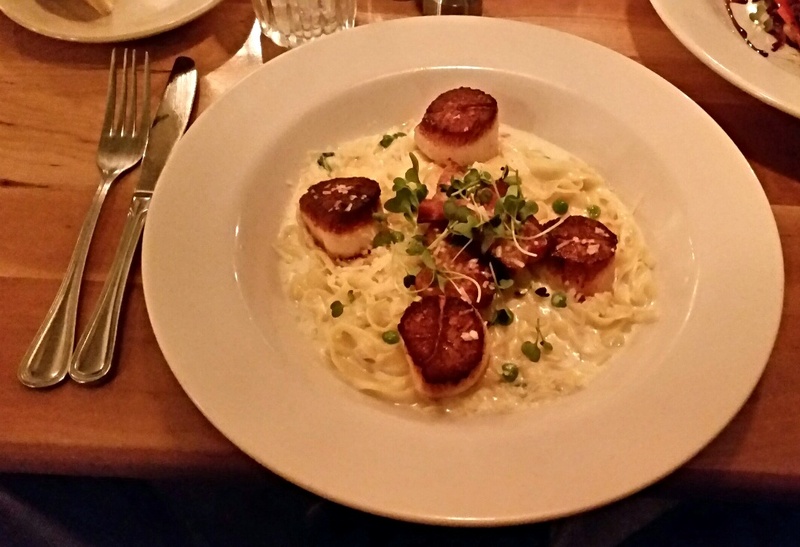 My scallops were fresh and my pasta delicious with the thick, heavy sauce. The pork was fantastic, though I trimmed it some according to my preference in order to get more of the meat and less of the fat. After a scallop and a couple bites of pasta, I went for a little of my wife’s food. The rice cake crisp and tasty and vegetables were excellent with the glaze. I passed on the salmon, but she confirmed that it was really good. I continued on with my food. It was wonderfully decadent. The flavors were super rich and delivered even better than I anticipated. It was the type of meal to eat if you’re definitely not going out after, more suited to sitting down and watching TV. Neither my wife nor I could finish our meals. It was a rarity for me, but I didn’t arrive overly hungry and the meal with the app was a lot of food. I took the rest of mine home. We were both quite happy with what we ate and having some left over for the next day didn’t hurt my feelings either. The meal came to a little over $90 after tip. Royal River Grill House was very good. It was a little expensive, but the food was awesome, the portions large, and the service was incredibly fast, though not inappropriately so. The restaurant is really aesthetically pleasing and it’s quite large, but I’d still recommend a reservation since it was nearly full when we were there. Definitely check it out if you want to try something outside of Portland that’s not too difficult to get to and will serve you some marvelous food. This entry was posted in Portland, ME food on March 1, 2017 by peterpeterportlandeater.